JLL Research has released its second-quarter '17 statistics on national office markets. The figures showed positive net absorption of 75,100 sq m over the quarter across CBD office markets and 291,500 sq m over the 2016/17 financial year. 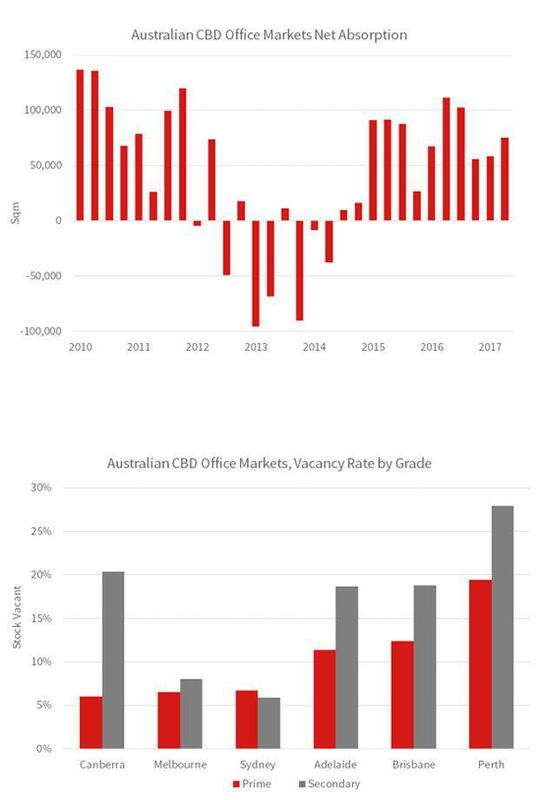 The national CBD office market vacancy rate fell to 10.9% in the '17 second-quarter – the lowest rate since March 2013. The Perth CBD recorded a third successive quarter of positive net absorption in Q2 (10,600 sq m) and a reduction in vacancy to 22.7%. Sub-lease availability in the Perth CBD has reduced by almost 24,000 sq m in 2017. Ballantyne said, “Our closely watched measure of sub-lease availability points towards improving sentiment in the Perth CBD office market. A willingness of multi-nationals and Perth based organisations to remove sub-lease availability in anticipation of medium-term revenue and headcount growth is a positive sign for the office leasing market. “A flight to quality is already evident in the Perth CBD with Premium Grade vacancy compressing to 7.8%. A Grade will be the next beneficiary of this trend with proactive owners allocating capex to assets to differentiate their product in the leasing market,” Ballantyne said. The recovery in Brisbane is more advanced than Perth with the Brisbane CBD recording a tenth successive quarter of positive net absorption in the '17 second-quarter. Brisbane CBD net absorption was 22,500 sq m in Q2 and 52,700 sq m over the 2016/17 financial year. Vacancy tightened by 0.8 percentage points over the quarter to 15.5%. Melbourne recorded the strongest net absorption in Q2 (24,600 sq m) and over the 2016/17 financial year (162,700 sq m). Vacancy tightened to 7.1% in Q2 – the lowest rate since 1Q12. Sydney CBD net absorption was constrained by a shortage of contiguous space in Q2 (1,900 sqm). Nevertheless, vacancy tightened to 6.4% – the lowest level since the 2008 second-quarter. Canberra recorded positive net absorption of 5,300 sq m in Q2, while vacancy was largely unchanged at 11.8%. Prime gross effective rents increased by 2.7% over the 2016/17 financial year. Adelaide recorded its highest quarterly positive net absorption figure since the '08 fourth-quarter in 2Q '17 (10,200 sq m). Leasing activity was concentrated in the secondary grade market and the headline vacancy rate tightened to 16.0%.